HARLEM — Dozens of angry students protested City College's decision to reclaim a controversial student-run community space for use as a career center by briefly occupying the lobby of the school's main academic building Monday afternoon. Without warning, student groups say, college officials took back the Guillermo Morales/Assata Shakur Student and Community Center on the third floor of the North Academic Center at 138th Street and Convent Avenue beginning early Sunday morning. The space was given to students following 1989 protests over tuition hikes. It is named for Morales, a Puerto Rican separatist who lost his fingers and an eye when a bomb he was making exploded, and Shakur, a member of the Black Liberation Army formerly known as Joanne Chesimard, who was convicted in the 1973 shooting death of a New Jersey state trooper. Shakur was the first woman to be added to the FBI's list of most wanted terrorists earlier this year. Both escaped police custody and are believed to be living in Cuba. "They chose the Sunday before midterms when students are off studying because they thought we were not going to pay attention or do something about it," said Glenda Ullauri, 22, a senior at the college and part of Sisters Circle Collective, one of at least 35 student and community groups that use the space. Books and other items owned by groups were also removed and remain unaccounted for, Ullauri said. "I felt lost because a lot of students use the space to study or to organize or get together with friends or even take a nap," she said. 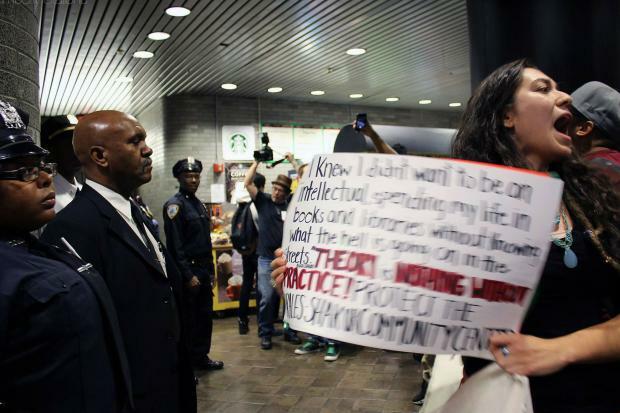 "This has displaced us as student organizers and it will displace community organizations." City College spokesman Ellis Simon said in a statement that the space was "reallocated for the expansion of the City College Careers and Professional Development Institute." The institute, which launched in 2012, is located on the first floor of the North Academic Center and helps students transition to the workforce. The expanded space will be used for "experiential learning," Simon said. "The expansion provides a quiet space for City College students to meet with alumni and professional employers to talk about internships and seek advice on various careers," he added. "The close proximity to the first-floor office is convenient, useful, and practical." As to why the move was done on a Sunday before midterm exams, Simon said it would be "less disruptive to the college." Items taken from the room are "in storage for safekeeping and will be returned appropriately," he added. Ullauri said students are not buying that explanation and see the move as an attempt to suppress student organizers. "There is a farm share that runs out of that space. They were there because they were serving this community," Ullauri said. "We have the right to that space and we want it back. We need it back." City College officials disagree that students have a right to the space. "There is no signed agreement of which I am aware. And, the college does not provide space to students in perpetuity," said Deidra W. Hill, City College's vice president for communications and marketing. Hill said students can use already established procedures to schedule the use of space for their activities. The school "remains committed to its mission of supporting free speech, students’ rights to protest," Simon added. City Councilman Ydanis Rodriguez was one of the student leaders who led protests in 1989 over tuition hikes. The then-president of the college agreed to give students that space for their organizing efforts, he said. "I hope that the administration of CUNY would reconsider the repurposing of the space," Rodriguez said. "It has a history since 1989 of being a space where students can organize in their efforts to have a strong voice to fight for a better education."